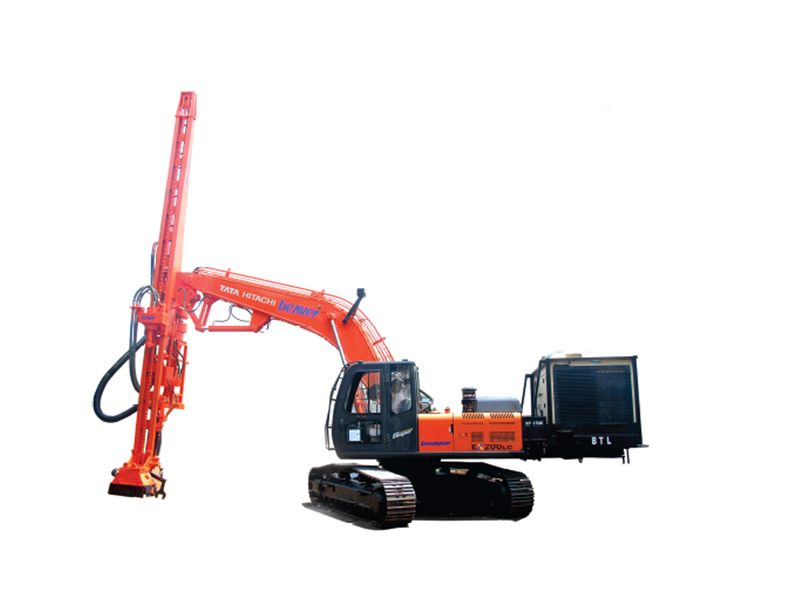 BLAST HOLE DRILLis a versatile hydraulic drill rig, mounted on a TATA Hitachi EX 200 LC Excavator (or any equivalent excavator)with onboard compressor, suitable for blast hole drilling in mines, can be easily accessible to drill on beach as well as below the ground level. Our Excavator mounted blast hole drill is a perfect high-performance solution for a wide variety of drilling applications and can operate in all Terrain conditions. Applications: Suitable for Blast hole drilling in mines,construction works, canal works and solar projects. Drilling Diameter (Blast hole) : 4.5" to 6.5"
Drilling Diameter (Solar Project) : 12.0"
Prime Mover : The Entire Rig hydraulic system will be powered by using same Prime mover of Excavator and seperate suitable Direction control valves will be provided for working of the drill rig. Breakout Arrangement : The Drill Rig is equpped with hydraulically operated breakout wrench for tightening and loosening of drill rods and hammer. Dust Collector (Optional) : Heavy Duty dust collector is provided forcollecting the drilling dust.